The University Scholarship is awarded to academically-talented, new freshman students from traditionally underrepresented groups or first generation college students who have demonstrated perseverance in achieving their academic goals. Congratulations! 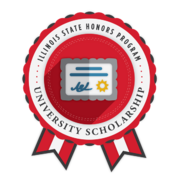 This badge recognizes your achievement in being named a University Scholar by the Illinois State University Office of Admissions.